Today I'm participating in the January PTI Blog Hop. 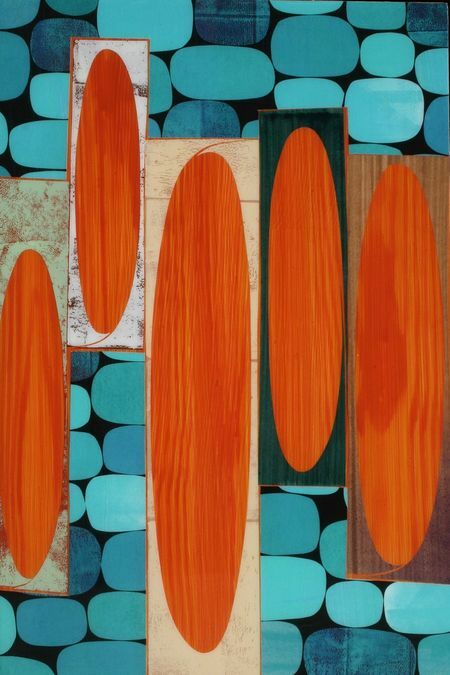 We have a colorful collage image by Alex Ray for our inspiration this month. Everything accept the sequins are from PTI on my card today - I used stamps from Watercolor Wonder and dies from Birthday Cheer and Tipped Tops Die set. I adhered both panels over the card with foam dots so they both stand out. Given the colors, this would make a great masculine card or it would also be a good card to give to co-workers or artists! I'm sure there is a lot of colorful inspiration over at Nicole's Papertrey Blog where everyone is linking their Blog Hop cards - I'm off to take a peak! Accessories: Dies - Birthday Cheer, Tipped Tops - PTI, foam dots, Sequins - Shaker Mix Vanilla Frost - Waltzingmouse. I LOVE the way you used watercolor wonders on your card! 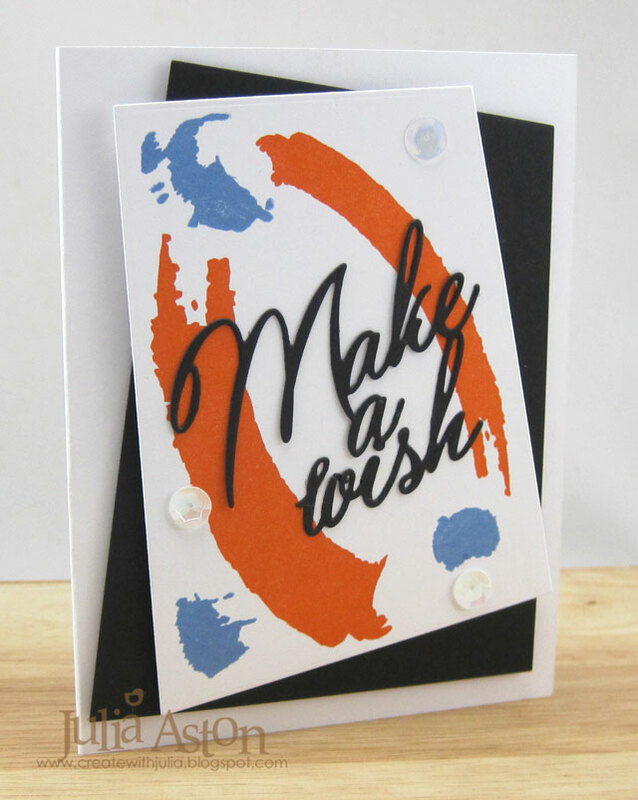 You could make this card over and over in any color combination! Nicely done Julia! Just in awe with your take. The layout has movement and beautifully frames the sentiment. Just brilliant, Julia! Love the brushstroke look and design! Bold and beautiful in these colors! Fabulously done, Julia! Love how you used those bold swooshes of color to frame your sentiment. What a great way to use Watercolor Wonder! Great interpretation of the inspiration photo! Love this card and layout! This is one of my favorite stamps sets (that I have never used...) You used it wonderfully! This is a delightfully fresh design using Watercolor Wonder and a wonderful interpretation of the challenge photo! Beautiful layers, Julia! The bold paint strokes are perfect paired with that great, big sentiment! You've inspired me to pull out Watercolor Wonder!! This is an awesome card. This is so bold and eye-catching, Julia! I love your take on the inspiration photo! Warercolor wonders - an all time favorite! Looks so great in these colors. Very nice card. Love how you went bold and beautiful with the inspiration! Stunning. Wonderful card! Love the splashes of color and your bold sentiment in black. Fabulous! What a great set to use for this inspiration piece! I love the graphic design and bold colors!! This is a fun striking card! Looks fantastic. So creative, Julia! Love how you used Watercolor Wonder--made me think of a rainbow which is perfect with the sentiment! Great design using Watercolor Wonder, Julia, and your black sentiment really pops! Julia, this is striking & beautiful. Waterolor wonder to the rescue - great choice! I like your boldness with the swooshes framing the sentiment. Love your layering and the orange and blue watercolor stamping is just perfect! Such a dynamic card in it's design and your stamp choices! So amazing!! I love your take on the inspiration photo!! So beautifully bold and bright.... just perfect for this inspiration photo/challenge! What a fantastic graphic design ... so bold and beautiful. Wonderful interpretation of the Blog Hop photo, Julia. Love the slashes of color and fun dies you used. Awesome card! Love that cool background! Love how you've used this set Julia - I've had this set for ages but I never seem to use the splodges! You've inspired me to give them some ink! Such a wonderful card, and a great take on the inspiration piece! Julia this is so cool, great take on the inspiration! awesome take on the challenge.. you rocked it..
Love how you've used the colours to create that great swirl of movement - very cool. Love the watercolor swipes of color! Makes your card extraordinary. Merry Monday - Is it still Christmas?